Third-year Henry Imburgia observes the field and prepares for the next play. 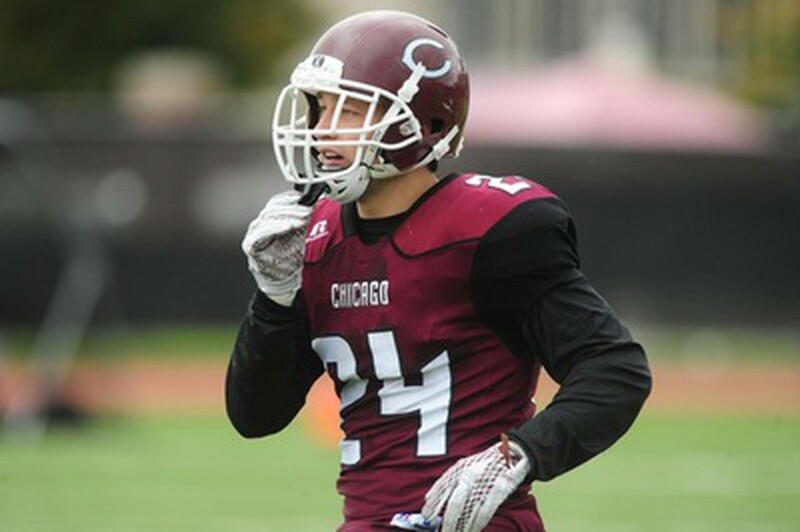 The University of Chicago football team (2–2) dominated Cornell College (2–2) this past weekend, outscoring the Rams 55–10. The Maroons established their running game early, with fourth-year Chandler Carroll rushing for three touchdowns in the first quarter. First-year quarterback Campbell Garrett also found success late in the first quarter with a 71-yard touchdown pass to third-year Trevor Anderson followed by a 46-yard touchdown pass to fourth-year Jamie Rieger. With the exception of scoring an 82-yard touchdown pass, Cornell College could not match the Maroon offense. One quarter into the game, the Maroons had dismembered the Rams with a score of 35–7. Following that explosive first quarter, the Maroons slowed down their offense to control the clock while adding onto their lead. In the second quarter, they extended their lead on Cornell with a 70-yard touchdown pass from Garrett to second-year Dante Nepa. Nepa showed incredible strength as he shook a cornerback off his body and forced his way into the end zone. The Maroons scored yet again in the first half with a 26-yard field goal by third-year Mike Kurzydlowski. As the game progressed, Cornell was stopped time and time again by the Maroon defense. The Maroon defense had undoubtedly their best game of the year, forcing eight turnovers and holding the Rams to 10 points. After another field goal by Kurzydlowski and a 55-yard rushing touchdown by first-year Riley Trettel, the Maroons capped off their offensive campaign at 55 points and 547 total yards. After a slow start to the season, the South Siders have won their last two games. They will be ready to face-off against the Lawrence University Vikings on Saturday. Lawrence is coming off a 34–0 loss to Monmouth College, lowering their record to 1–3. They are currently on a two-game losing streak. All signs point to the Maroons winning their third consecutive game this upcoming weekend. The team is still doing everything they can to prepare for this game. “Just like last week, we think they’ll be another good team that we can’t take lightly,” added Urquhart. “In every practice we’re trying to fix the things that we didn’t do right last week and improve from there.” With exceptional play on both sides of the ball, the Maroons have a bright future ahead. The Maroons’ matchup against the Vikings is scheduled for this Saturday, October 7 at 1 p.m. on Stagg Field.